We can all benefit from time taken to relax and restore – and this Relax and Restore yoga class will help you do precisely that! Enjoy a feel-good warm-up to help your body unwind and decompress, and witness these benefits flow over into your mind as well. Slowly and gradually work into a short sequence to build strength and increase your heart rate while maintaining mindful movement and deep breathing, before slowing it back down. Relax and Restore will help you tap into a deep sense of body awareness and presence as you focus on your breathing and move mindfully through gentle stretches and rejuvenating poses to create space, get your blood pumping, and bring it all inward for your final resting pose. Dive into a juicy, relaxing 38-minute gentle yoga flow with YogiApproved teacher Ashton August. All you need is a yoga mat for this practice. If you would like to incorporate a yoga block or two into your practice, feel free to keep those on hand (not required). Meet Ashton on your mat and get ready to feel great! The Reversible Bra is finished with a smooth, thick band under the bust, it offers medium support and won’t pinch or dig in during workouts. The Harem pants are made of organic cotton fabric. They are soft and comfortable, Definitely, the kind of pants you want to live in! Experience Liforme’s original alignment system and durable, eco-friendly rubber mat. 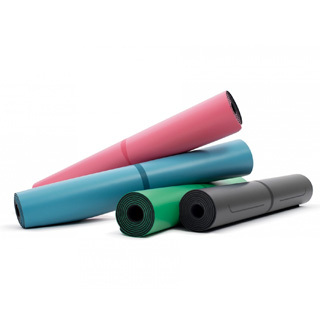 This yoga mat is wider and longer than a standard mat and also comes with a quality carrying case. This article has been read 70 times. Share it and spread the love!